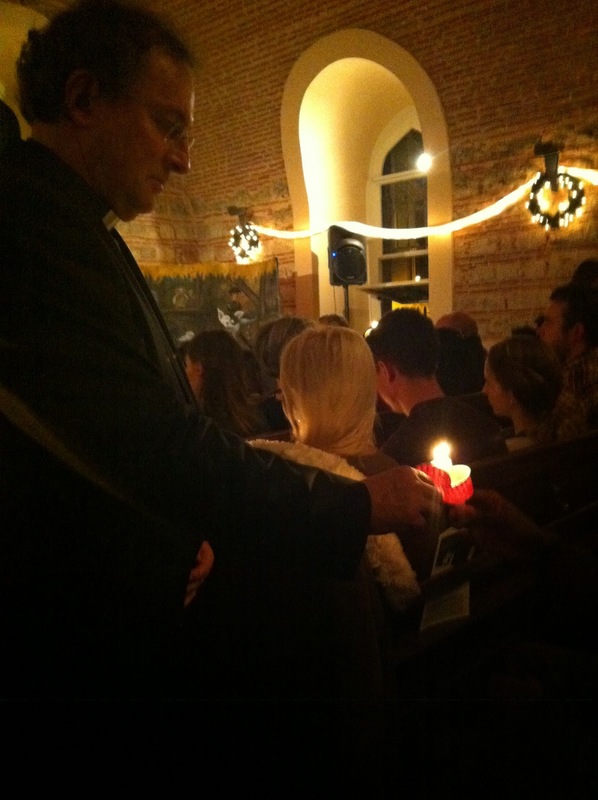 This entry is about my marathon of Christmas masses in Istanbul. I remember suggesting an American traveler to spend the Christmas holiday in Istanbul. He had raised an eye brow in hesitation and said “Christmas in a Muslim city? I don’t think so”. This was a quick answer without giving a thought to the fact that Istanbul was Constantinople, leading city of Christendom for about 1,000 years. It has been home to numerous Christians communities who thrived in the region for centuries. While Greek Orthodox is the best known; there are also Armenians, Georgians, Bulgarians and Syrian Orthodox who still speak the language of Jesus Christ, the Aramaic. Besides, Istanbul started to be the home of numerous European trading colonies as early as Byzantine period. Fashion continued during the Ottoman period, and in fact population of European settlers increased as Ottoman Sultans gave trading rights as well as land for them to establish their own communities. To start their communities, they first built a church and established themselves and their public buildings around this church. All of these explain why there are numerous churches of different denominations in Istanbul, some of which are still active with congregations. Current day congregations consist of children of former traders who settled in Istanbul -now natives-, expats living in Istanbul, Consulate people representing their countries in Istanbul and Turkish Christians. I started by making a list of Istanbul churches that hold a Christmas mass. I was planning to visit all active churches during the mass. When I noticed number way exceeded what a person can actually cover, I decided to visit the bigger and better known churches which are located around the Istiklal Street, not further. The fact that not all denominations hold the mass on the exact same day is helping me. 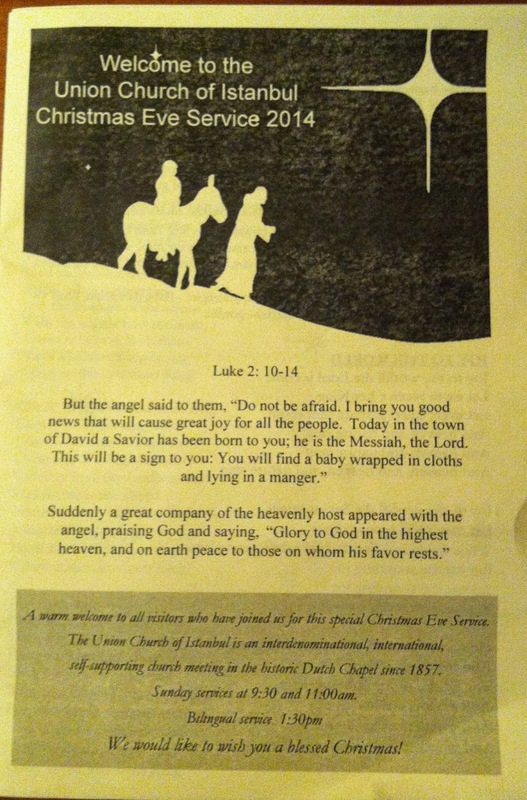 In Catholic and Protestant churches, there mass is on the Christmas Eve, on December 24. 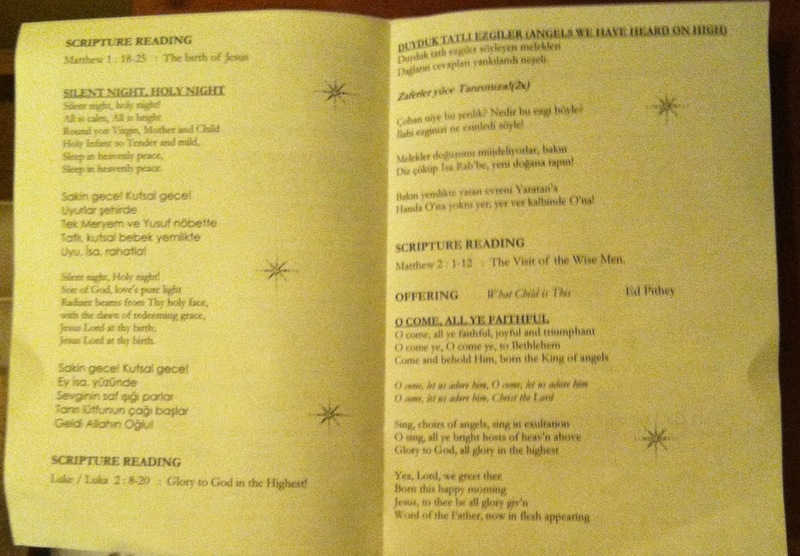 In Greek Orthodox and Syrian Orthodox churches mass is on Christmas day, on December 25. And, in the Armenian churches mass is on January 6. On December 24, I started my visit with the German Protestant Church. 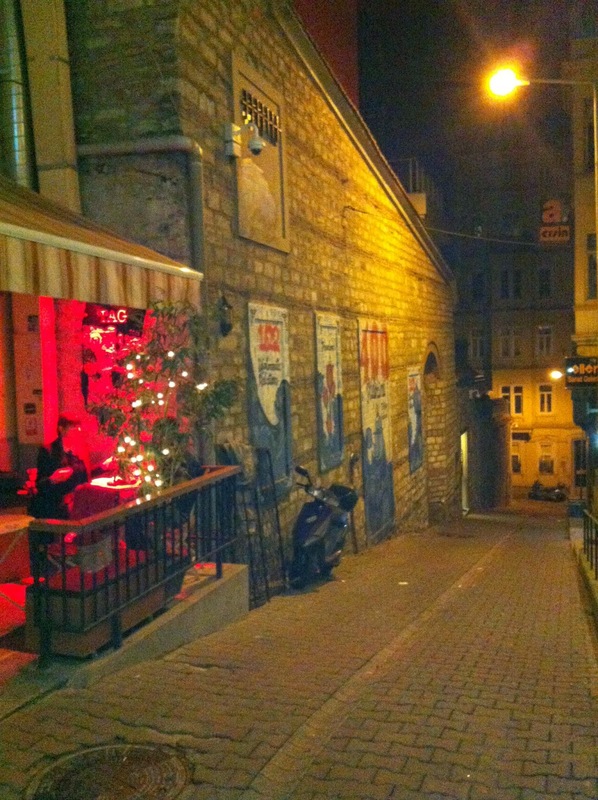 It is a short walk from the famous Istiklal Street and located in a narrow side street. Because I was stuck in traffic I arrived at the church after the mass ended. As I was walking in, a very friendly looking female pastor was bidding farewell to her congregation. The congregation was casual, they looked relaxed and they gave the impression of a congregation knowing one another. Walking in the church, I was happily surprised to see the announcement of an upcoming church concert. 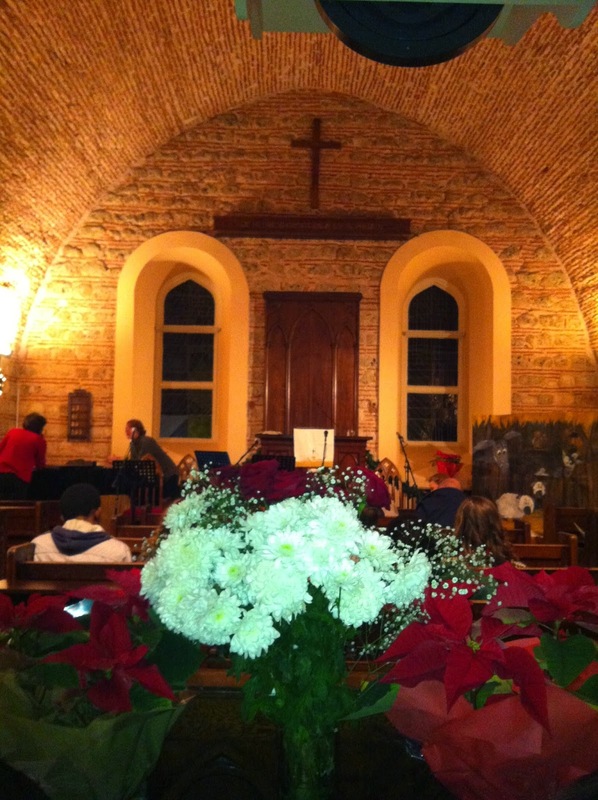 Church concerts are rare in Turkey and photographed it to announce. With the rest of the crowd, I left and headed towards the Armenian Catholic Church, the Surp Hovhan Vosgeperan, just off the Taksim Square. It was an easy 10 minute walk. Ok, I accept, I am a bad photographer. It says Concert on January 17 at 19:30 (7:30pm). Entry is 20 TL. Surp Hovhan Vosgeperan is an impressive building from the early 19th century, it can seat around 700 people. Armenian Catholic church was formally established in the late 18th century. They accept the Bishop of Rome as spiritual leader of the Church and they are regulated by Eastern canon law. I arrived at the church well before the mass started. This gave me a chance to observe the congregation flowing in and their interaction among one another. Children happily dressed in red Santa outfits and hats passed me and others leaflets for the mass. People were excited to congregate in such a joyous holiday. Noticing that I am not one of the regulars, they warmly and kindly greeted me. No questions asked, everyone is welcome. I felt very comfortable and settled in a bench where I can see the action. The church quickly filled up and some visitors had to stand up at the back and the sides. It was mostly families, people of all ages. People were dressed up neatly, if not formally. Mothers were trying to hush their children, felt very familiar. The clergy were dressed in typical Catholic fashion, they were wearing robes of fancy fabrics and hats based on their hierarchy. It was a formal ceremony. After the prayers and hymns in Armenian, the (Arc?) Bishop carried on his sermon in Turkish, as he started he didn’t neglect to say that he would continue in Turkish so all can understand him. Most of the congregation spoke very fluent Turkish. To my surprise, the sermon was not a religious one all the way, but rather an interfaith speech emphasizing moral values and similarities between religions. I liked it. I assume it was a sermon that many people would have liked and agreed with. Kids dressed in Santa costumes were very cute. Ok, I am a bad camera person too, but you can watch a short recording of a Catholic mass in Armenian and hear the impressive choir. 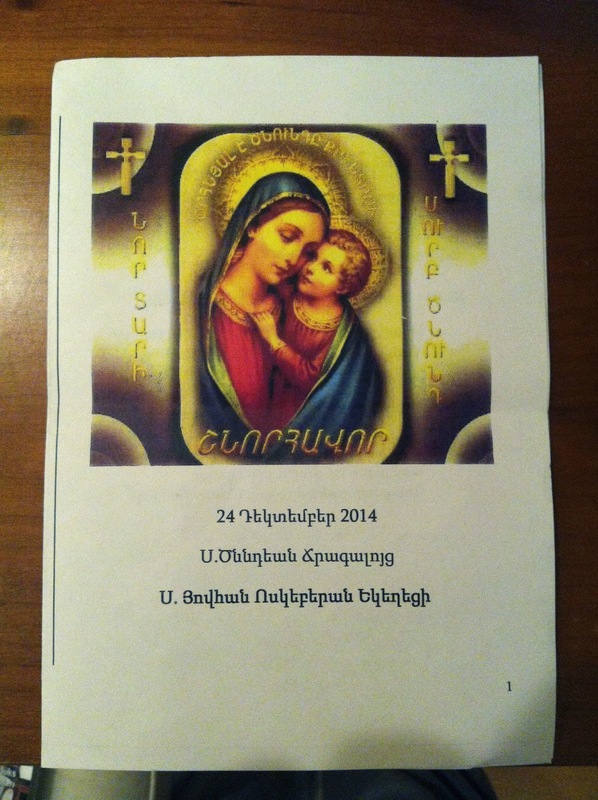 Leaflet of the mass in Armenian. Though I wanted to stay till the end of the mass, I silently slipped out as I had two more churches in my list. Istiklal Street, heart of Pera, the heart former non muslim neighborhood is the main pedestrian drag today and always crowded. When I see city photos, I always wonder how the city sounds, so here is a short recording of how Istiklal Street sounds at night. My next destination was the main Catholic church of the city, the Basilica of St. Anthony of Padua located right on the Istiklal Street. Istiklal Street is always crowded, around the clock, as I neared the church the crowds got intense. It felt like walking in a packed suburban train at the rush hour. I hardly made way to enter the courtyard. It was nicely decorated with lights, a beautiful Christmas tree, and a well displayed scene of Nativity. People were flowing in, not necessarily the devout for mass, but it rather seemed like everyone on the street who wanted to see what was going on and how the mass was conducted. Visitors were competing with one another for an empty spot in front of the Christmas tree for a souvenir photo or a selfie. I tried to enter the church, but it was so crowded that I could not even pass beyond the interior gate. This didn’t trouble me, I knew that the mass would go on till midnight and I could come back at a later hour. Listening to the church bells in Istanbul. I shot this from the courtyard of the Basilica, hoping that it would be a 360 view of the complex. Visitors taking photos in front of the Christmas tree, maybe the nicest in all of Istanbul. So, I moved on to the friendly Dutch Chapel, last church of the night in my list, about a 10 minute walk from the St. Anthony’s. Although just called the Dutch Chapel in the local jargon, it is the Union Church of Istanbul meeting in the historic Dutch Chapel. It is just off the Istiklal Street, on the side of the Dutch Consulate. A tiny brick chapel from the 19th century. The Union Church is an international and interdenominational Protestant church, claimed to be the oldest congregation of its type anywhere in the world. One of it’s founders was Cyrus Hamlin. He was also the founder of the prestigious Robert College, the first American mission school. Information on the web site of the church says that church has attendees from 40 different countries. “The worship at the church reflects the cultural richness of the church. It is amazing how many people from different continents contribute to make it a unique experience,” says van Rensburg, the pastor. I want to point out that this also notes the cultural richness of Istanbul, Queen of all cities. Street that Dutch Chapel is on. Posters on the wall commemorate 400 years of diplomatic relations between Holland and Turkey. Interior of the Dutch Chapel. The Dutch Chapel is like the “Mecca” of Americans in Istanbul. 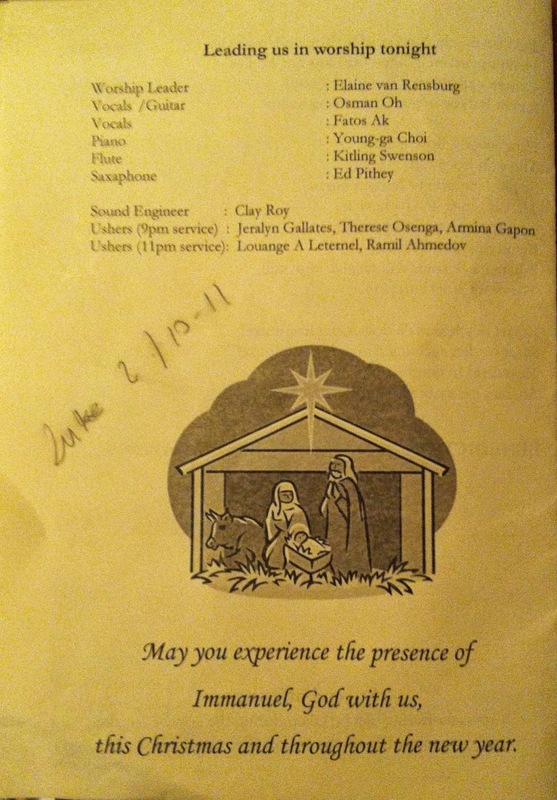 Because it is small, they held 3 consecutive masses on the Christmas Eve, as they do multiple masses every Sunday. I knew that the earlier 6pm mass would be very crowded, I attended the 9pm mass. I arrived at the chapel before the mass started, I sat down, relaxed and watch around. Attendees were mostly Americans many of whom spoke Turkish. There were occasional Turks; even few Turkish gals dressed up in scarfs, the current typical fashion of devout muslim women. The church is physically humble. Many people knew one another; they were chatting casually and exchanging local news of their social circle, their plans for Christmas or about the news neighborhoods whey live in. Just normal, casual, local chatter. Although I didn’t see any apples or cinnamon buns, it felt it smelled apples and cinnamons. 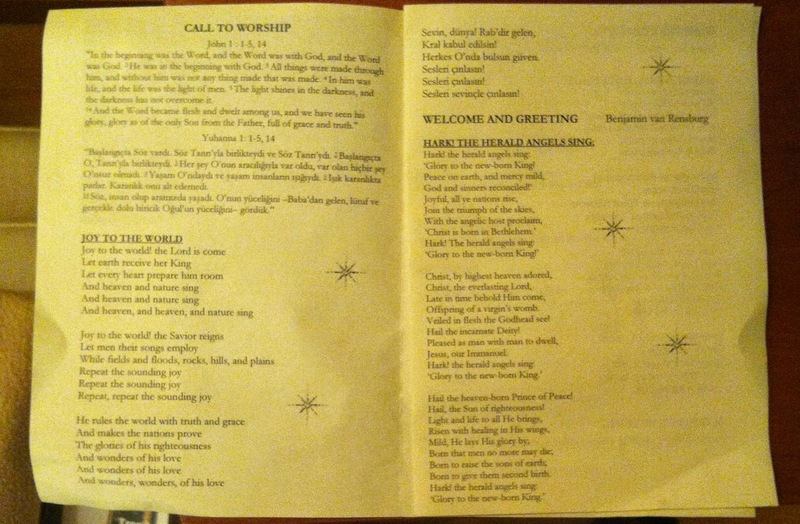 Hand out from the Dutch Chapel, both in English and Turkish. 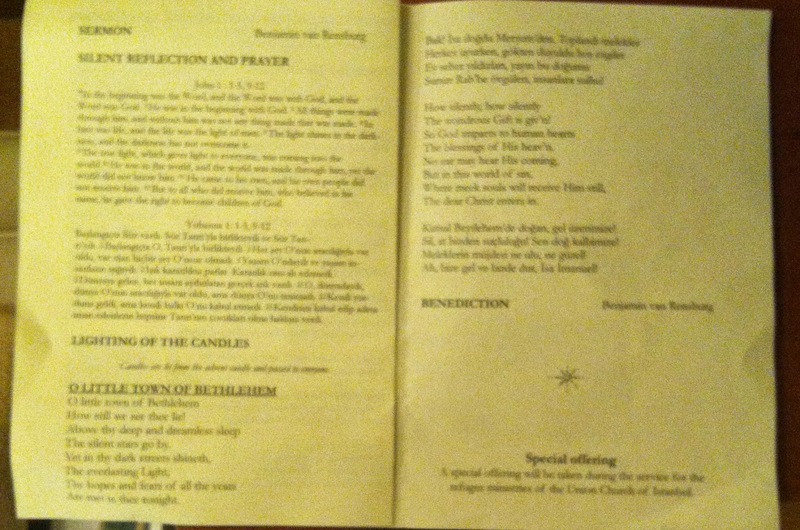 The mass was both in English and Turkish, so was the printed leaflet I brought home. The hymns were sung in partly in Turkish, partly in English. The service felt very informal. The lady leading the worship had a soft voice and she told the congregation when to sit down or stand up, sort of like an orchestra conductor, not something I observed in the Armenian Catholic church. All in all, the mass took about slightly over an hour. Congregation dispersed easily at the end. I took my baggie of goodies, it had some candies and a small prayer in a gift pack. I headed back to the St. Anthony’s. Angels we have heard on high in Turkish. It was almost 11pm, Istiklal Street was crowded, but the crowds outside the St. Anthony’s were less. I walked inside and entered the church. Interior was still crowded, more people were standing than those seated. It was noisy. For a moment, I thought of the clergy who had to carry on the mass in that mess and I felt sorry for them. I silently walked to the side aisle. I was silent but not others, it sort of felt like a cocktail prolonge rather than a church with a Christmas mass going on. I attempted to approach the benches hoping to find a place to sit, my attempt was unsuccessful. I turned back and respectfully left the church planning that I would go to another Latin Catholic church for the Christmas mass of 2015 (there are few others in short walking distance). I suppose the recent visit of the Pope contributed in the over popularity of this church. Video of the mass at the Basilica. If I had pushed myself to to do more, I could easily attended the masses at few other churches including the Anglican Churches, but thinking of my two sons for whom I needed to prepare a hearty breakfast for the next morning before school, I headed home. I don’t know about the others, but Christmas celebrations in this Muslim city is a two week long event from December 24 till January 6. People can simply walk to the church of another denomination in a few minutes and be welcome at each. To wrap up, Christmas is not an official holiday in Turkey, nothing closes, life goes on as it is (birthday of Prophet Muhammed is not an official holiday either). This doesn’t prevent Christian residents to celebrate in their own fashion, their schools observe the holiday and close. There are lights in major streets, malls and buildings, we call them New Year lights. You can see decorated and lit up trees here and there, which we call “New Year trees”. One can always make reason to celebrate and rejoice. Thinking of the verses in the Holy Quran talking about the immaculate conception of Mary and miraculous birth and life of Jesus, I see no reason not to celebrate his birth.